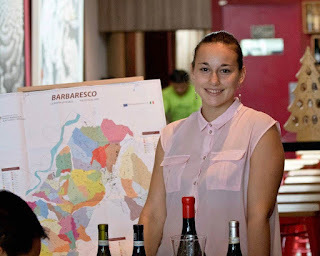 When asked about her job in the winery, Michela Adriano explained with a mischievous smile: “It's a family run winery, there’s no strict job specification for family members here; whatever tasks come your way, you do it”. She was in town to conduct a workshop on her family’s winery and wines. The Agricola Adriano Marco and Vittorio winery is located in the Langhe region of Piedmont, close to the city of Alba. The region is famous for its wines, white truffles and rustic appeal. Presently the vineyards are located in San Rocco Seno d' Elvio (Alba) and in Neive. Michela informs that the family land was originally bought by her grandfather (Giuseppe) who began the task of planting vines within the acquisition. His son Aldo continued with the job of planting more vines when the land was passed to him. When the grandsons (Michela’s father and uncle) took on the management of the vineyards, they progressed into winemaking and bottling wines under their own label. At present the white wine varietals grown are Moscato and Sauvignon blanc; and the red wine varietals are Nebbiolo, Barbera, Dolcetta and Freisa. A pleasant surprise is this winery’s Langhe Sauvignon Blanc Basarico DOC. By and large we often get white wines from Piedmont made using Arneis and Cortese varietals. Sauvignon blancs from Piedmont are not a common fare over here. It certainly provides a welcoming addition to the offerings from this wine region. Ever came across the Freisa varietal? A first for me. Michela explained that this red is used to produce different styles of wine from dry to sweet, and still to fizzy in Piedmont. In their winery, they use it to produce a dry red which is lightly sparkling. Unlike other wines made from Nebbiolo, Barbera or Dolcetta, a Freisa red is rarely heard of in Singapore and is certainly worth a curious venture. Fresh, clean, light plus body with light grassy and herb notes backed by refreshing acidity. Shows itself in a delicate manner. The vines are located about 250m above sea level; on hillside vineyards facing north-east and west in Alba. The grapes are gently pressed, fermented and stored in stainless steel tanks under controlled temperature before bottling. Red berry aromas; medium body, smooth texture, berry fruit flavours holding well against acidity in palate. Not a complex wine; more favoured for its easy approachability. The vines are located about 300m above sea level; on hillside vineyards facing east and west in Alba and facing south-east in Nieve. The crushed grapes undergoes fermentation on skin in stainless steel tanks; the finished wine is stored in stainless steel tanks as well before bottling. It undergoes bottle aging for 6 months before release. Garnet red; gentle floral, fruit and spice aromas; medium plus body with red fruit notes showing on the palate; notable tannin presence leading to astringency; acidity adding to structure. Shows a long finish with tannin presence. The vines are located about 300m above sea level; on south facing slopes. Fermentation takes place in stainless steel tanks; aging of finished wine takes place for a year in stainless steel tanks and another year in medium sized oak casks from 35-50 hl. Upon bottling, the wine is aged for 6 months. A splendid wine with good showing on the nose and palate. Garnet red, medium plus body, well integrated wine with flavours showing in layers (tertiary development), smooth texture; tannins and acidity supporting fruit and spice notes in the palate; well balanced, it has a rustic appeal about it. Long, lingering finish with potential to age further. Certainly an elegant wine which you can sit back and enjoy. The vines are located about 300m above sea level; on south facing slopes in Nieve. Fermentation takes place in stainless steel tanks; aging of finished wine takes place for a year in stainless steel tanks and 2 years in medium sized oak casks from 35-50 hl. Upon bottling, the wine is aged for 12 months.